The Boardwalk Bakery at Walt Disney World Resort’s Boardwalk Inn is currently closed for renovations, according to our friends at The Disney Food Blog. The popular breakfast, lunch and dessert eatery will be closed until April 26 for renovations, which will include several new features as well as brand-new menu items to enhance the guest experience. When the bakery reopens, guests will enjoy a brand-new queue, a new entrance and a refillable mug station as well as new sandwiches and soups. A temporary location has been set up during the closure, and is located between the Boardwalk to Go kiosk and Boardwalk Joe’s Margarita Bar. The temporary location will serve a limited number of menu items and will be open from 6:30 a.m. to 11:30 p.m.
As for the refillable mugs, guests will still be able to purchase these souvenirs at the temporary location or at Seashore Sweets. 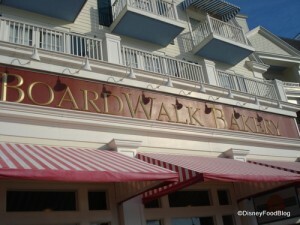 Are you excited about the renovations coming to Boardwalk Bakery? What are you looking forward to the most when the bakery reopens?